On Sunday, June 12, President John Dramani Mahama took a risk by ignoring his usual high-powered convoy to roam with a motorbike. 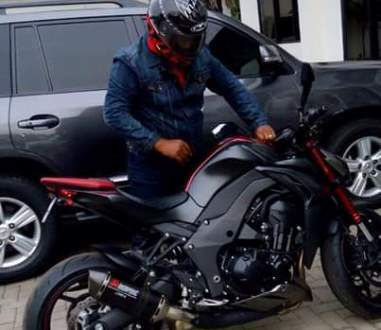 Mahama roamed some towns in the capital city, Accra, on a motorbike to check areas which were affected by the flood and this got everyone on social media talking. Some bashed him for not fixing the economy instead of riding on a motorbike while others praised him for taking such a risk without fear. Below are a few tweets Ghanafuo.com gathered for you. Read and share your views too with us. Enti Mahama b3tumi etwi motor? Yep! Okay… But i love Prez. Mahama’s biking adventure anyway. Cool dude! I wish i could say same abt his government tho…Still my President! Mahama ride motor, people dey diss am. If Obama go rap, chaw people go say he get swag. Ooh Ghana, hypocrisy go kill us. @browniche have mixed feelings about Mahama though. Still has a place on my thumb but his people make me angry. NPP is not serious. Sham! John Dramani Mahama is definitely the most trolled president in Ghana’s political history.. I trust Mahama more than Airtel. @eastsportsman Nothing Mahama does escape your attention. Anti Mahama guys like yourself dey try mmom. I applaud you for your consistency.